Our Spring Programme 2019 is now available and you can pick up your copy of the beautiful printed brochure at GWL, take a look on our website, or download a pdf programme to find out all about events and projects happening this season. We often shout proudly about how equality, diversity and inclusion are at the heart of our work. In this programme we focus on another value close to us, as we highlight the importance of thinking widely about our environment and our changing world. In our Women and Environment strand you’ll find a conference, creative writing workshops and story cafes, exploring activism, nature writing and optimistic responses to our environmental challenges. 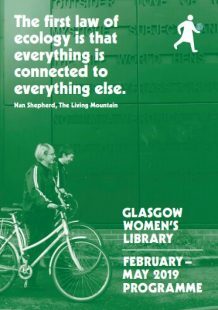 We’ll discover poetry, non-fiction and prose about women, space and place by writers including Kathleen Jamie, Vandana Shiva and Nan Shepherd. We’re trying to make our programme as accessible as possible and with this in mind we’re delighted to present our programme in large print and audio formats. Below you can download your copy of a large print version of our programme and there’s an audio version further down the page for you to listen at your leisure. If you have any thoughts or suggestions on these formats, or on accessibility in general, please do let us know. This entry was posted in Blog, News and tagged with programme launch, Spring Programme, Spring Programme 2019.